Tangier, the White city of Morocco was an adventurous playground for the rich and famous from the 20s to the late 50s, till it was relinquished by Spain and returned to Morocco. From artists and authors to aristocrats and spies, Tangier was visited by Truman Capote, Tennessee Williams, Barbara Hutton (Woolworth heiress) and the likes. Today the souks and the traditional cuisine, the historical and cultural richness all beckon the traveler to make Moroccan holiday the most memorable one. One of the highlights is the port with its state-of-the-art technology dealing with imports and exports along side which yachts of millionaires beautify the coastline. Tangier also holds the reputation of being the first gay resort in the world, though it is not quite as popular for that status now. Tourists not only find the beautiful beaches mesmerizing but are also absorbed into the energetic, likeable and individualistic enduring charm of Tangier. Akin to Moroccan cities, Tangier has Ville Nouvelle and Medina which makes moving around the city pretty easy. Public transport city buses ply between train station, airport and popular sites like Caves of Hercules and Grand Socco. To visit other places taxis are available in 2 types – one that carries up to 6 people and a smaller metered one that can accommodate 3 people. However after 8pm till morning the rates are hiked by 50 percent. Being a tourist haven there is no dearth for hotels and motels that suit every budget. Campers get to choose from 2 sites Miramonte and Tingis that are not only close to city center but also within walking distances from the beaches. These sites are reputed to be safe and convenient. 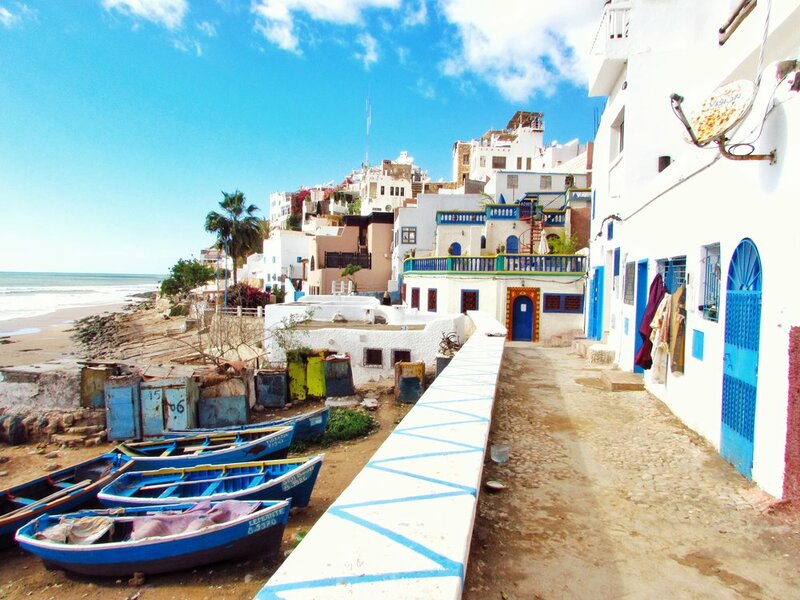 Asilah – The venue of Asilah Arts Festival held here in August, this otherwise quiet fishing village is filled with world renowned artists and performers. Being close to Paradise Beach, Asilah is a popular seaside resort the rest of the year and has a relaxing ambience. One of the places worth visiting here is the picturesque Andalusian medina built in the 15th century. This small town can be explored on foot but the donkey carts are a fun way of enjoying your holidays. While at Asilah don’t forget to try seafood variety at the renowned restaurants. Regular trains ply between Asilah and Tangier. Chefchaouen – is an exquisite medieval town with distinctive Spanish quality situated in the mountain region of Tangier. The town’s medina looks most charming with whitewashed and blue-rinsed gabled houses and buildings. Craftsmen sewing caftans or embroidering jellabahs is a common sight here. A must visit place is the Great Mosque built in the 17th century in front of which today stand mulberry trees and restaurants cooking up mouth watering delicacies. While here don’t forget to shop for leather goods, carpets, copper ware and pottery in the souks surrounding the square. To streamline and minimize blog maintenance, I will be discontinuing maintaining the Travelnowsimply.com website (however, I will still hold the domain). I will gradually move all articles from this site to Ahmed Dawn Dot Com site. This article originally published on the above website on Feb 17, 2011. At Melbourne (MEL) airport I went to the Quantas Business Class counter to get my boarding pass. I was expecting a lot more hospitality like what I got at EVA AIR counter, but it was nowhere near that. Actually, it felt like an economy class counter. Once I was done at the counter, I was heading to the security gate. Unexpectedly, I was chosen, along with a couple of female flight attendants, for a special random security check. All airports do this kind of random checking, but this was my first time I had this experience pulling me out from the regular queue. All of us were taken to a small room, asked to open our luggage and lay it flat. I did what I was told. A security person went through my bag and ran a detector. It was very quick. After finishing there, I had the idea that I didn’t have to go through the regular security check, but I was wrong. I had to go through the usual security check again, but this part was quick as well. Quantas Business Class travelers to foreign destinations get to experience the Qantas International Business Lounge. It took me a while to get to the lounge because I was looking for the lounge on the ground level. But the lounge is actually located on the basement level 1. Quantas Business Class lounge is used by Quantas, Oneworld partner airlines, and even non-alliance partners such as China Eastern. In the next post, I will talk little more about the Quantas Business Class lounge. I am flying to Auckland, New Zealand, but I will be back to Australia again, in Sydney from Auckland. If you are ever traveling to Africa, the one city you need to check out is without a doubt, Rabat. Rabat is a unique and stunning city that will delight any traveler who makes their way to it. Rabat, which means “Fortified Place” has been inhabited for thousands of years, including by the Roman Empire. Currently, the city has a population of 650,000 people and it is the capital of Morocco, rather than Casablanca as many assume. It is also the second-largest city in the country and the capital of the Rabat Sale Zemmour Zaer region. The city is located on the Atlantic Ocean, at the mouth of the Bou Regreg River, giving it beautiful views and landscapes around it. There are several smaller bedroom communities around Rabat including Sale and Temara, which give the region a population of 1.8 million. The city used to be a very important port city, but these days it is more geared towards textile, food processing and construction. Sadly, some multinational corporations do operate sweatshops in the area. Tourism has also become very popular in the city thanks to the many foreign embassies and the effort to get tourists to the city. Casablanca is more famous, but Rabat is working hard to get noticed. Rabat is popular among Europeans because of its warm Mediterranean climate. It has a mile temperate climate with cool weather in the winter and warm days in the summer. Throughout the year, the nights are cold due to its proximity to the desert. When the day comes along, the temperature usually rises by about 15 degrees Celsius. The high in the winter, at its coldest days, usually reaches only 17.5 degrees Celsius. Chellah: This is the old city that was founded by the Carthaginians and conquered by the Romans, then passed to the Arabs over time. It has been abandoned and settled a great deal over time and parts of this old town are still visible. Kasbah of the Oudaias: This is a deserted Kasbah that was used during the reign of the Almohads back in the early part of the second millennium AD. The Kasbah was deserted following the death of Yaqqub al-Mansur in 1199 AD. Hassan Tower: This is an incomplete mosque that was going to be the world’s largest when construction was started in 1199. It only reached 140 feet, half the 260 feet that it was intended to be. This is a very important part of the historic and tourist aspects of the city. So, take a trip out to Rabat and see this amazing city for yourself, you will not be disappointed. To streamline and minimize blog maintenance, I will be discontinuing maintaining the Travelnowsimply.com website (however, I will still hold the domain). I will gradually move all articles from this site to Ahmed Dawn Dot Com. This article originally published on the above website on Nov 13, 2010. One of the most beautiful and famous cities in the world is Casablanca, and it is a popular place to visit for any tourist who wants to see a very unique city. This city is anything but a rundown city that had its best days in the past. In fact it is the largest city in Morocco with over four million people, and it is a very cosmopolitan city, as well as the economic heart of the country. Casablanca was founded by Berber fishermen in the roughly 3,000 years ago and was then used by a series of conquerors, including the Roman Empire. Destroyed by an earthquake in 1755, it was rebuilt by the sultan of the Morocco and called Casablanca. Casablanca may be seem like it is a backwards city in terms of being progressive but it is the most liberal and progressive of Morocco’s cities, with young men often seen talking outdoors with scantily-clad women, something not seen in more extreme Muslim countries. Casablanca has the largest artificial port in the world, and an interesting place to check out. The King Hassan II Mosque is the largest mosque in Morocco and the third largest in the world, with the tallest minaret in the world. 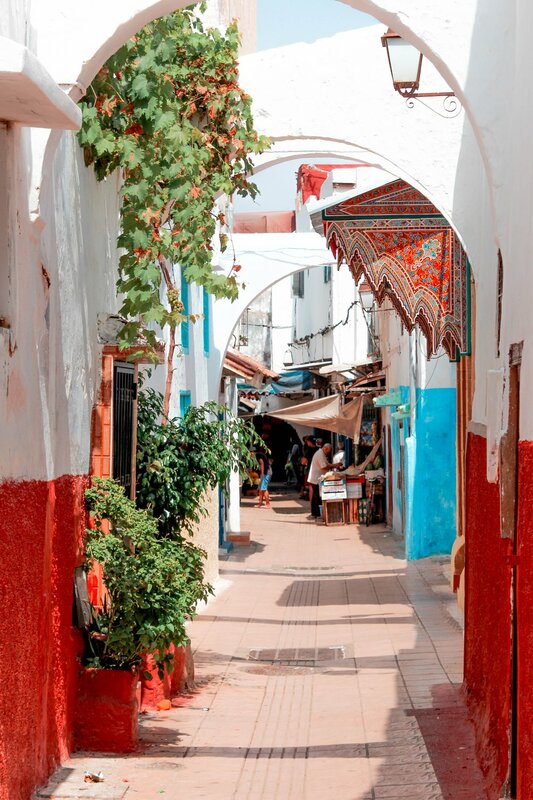 The Old Medina is a small walled town in the northern part of Casablanca which is where you can find many amazing things to buy from the vendors of the city. The Shrine of Sidi Abderrahman is a shrine built on a rock off the shore and you can only get to it when there is low-tide. The shrine itself is off-limits to non-Muslims, but you can explore the medina that is around it. Casablanca is a very safe city to visit as well, so you do not have to worry that because you are traveling to Africa, you are going somewhere horribly dangerous. Most tourist agencies will tell you that common sense will keep 99 percent of problems from occurring. These are things like not flashing large amount of money around, and not looking like a tourist. You should be aware of tourist guides who are not really guides and only interested in robbing you, but these guides are much less of a problem in Casablanca than anywhere else in Morocco. Typically, the worst that you will encounter in Casablanca is people trying to hassle you or bother you. Being firm with them will usually get them to move on. While annoying, they are far from dangerous and not something you should be overly worried about. Women traveling in Casablanca will be harassed with lewd comments if they do not dress modestly, but should not worry about being bothered or harassed physically. Casablanca is an amazing city that you should consider as a destination if you are traveling to Africa. It has everything a major city should have, and it has thousands of years of history.